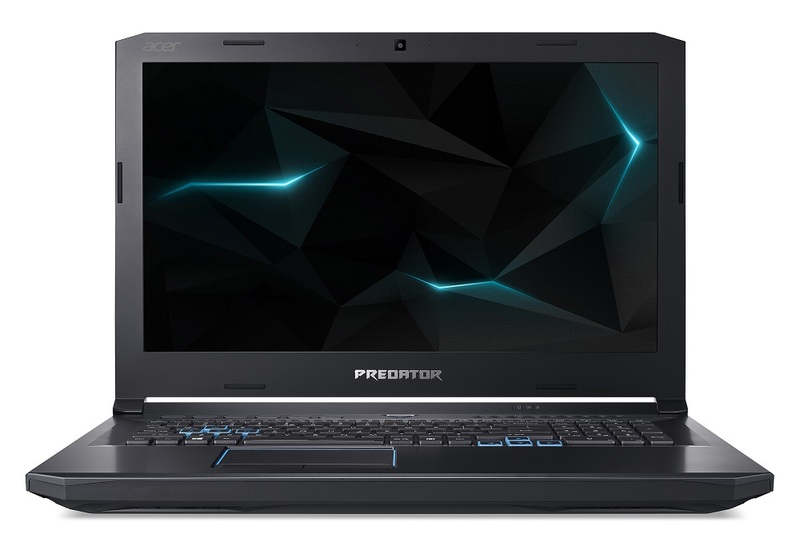 · The new Predator Helios 500 combines up to overclockable 8th Gen Intel® Core™ i9+ processors with overclockable NVIDIA® GeForce® GTX 1070 graphics for a gaming force to be reckoned with. · Superior thermal architecture keeps the Predator Helios 500 running nice and cool during marathon gaming sessions. · The Predator Helios 500 offers sophisticated flair with blue lighting and trim accents that pop on its obsidian black chassis. 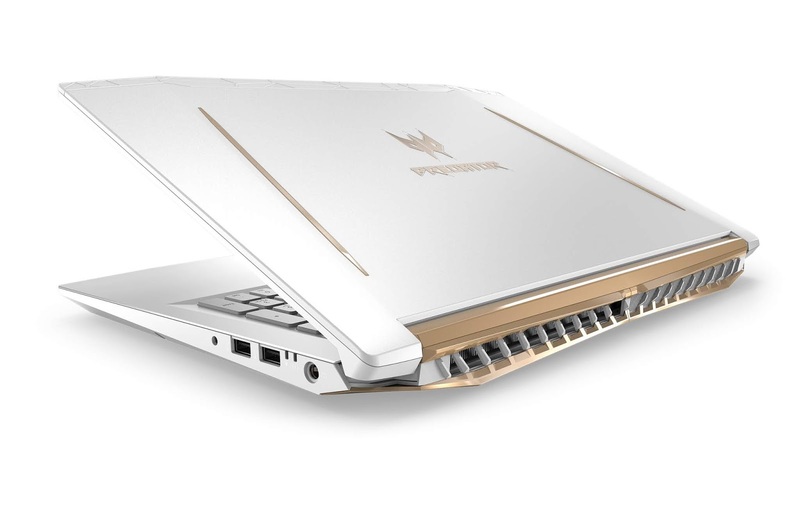 · The Predator Helios 300 Special Edition radiates class with its distinctive white chassis accented with elegant gold trim. · The Predator Helios 300 Special Edition features 15.6-inch FHD IPS displays with an upgraded 144Hz refresh rate, 8th Gen Intel Core i7+ processor and overclockable NVIDIA GeForce GTX 1060 graphics. Designed for extreme gamers, the Predator Helios 500 is a gaming beast. It features up to overclockable 8th Gen Intel Core i9+ processors[i] and overclockable GeForce® GTX 1070 graphics. Intel® Optane™ memory1 increases responsiveness and load times, while ultra-fast NVMePCIe SSDs, Killer DoubleShot Pro networking, and up to 64GB of memory keep the action going, making the Helios 500 the ideal gaming notebook for graphic-intensive AAA titles and live streaming. Top-notch visuals are delivered on bright, vibrant 4K UHD or FHD IPS 17.3-inch displays with 144Hz refresh rates for blur- and tear-free gameplay. NVIDIA® G-SYNC® technology is supported on both the built-in display and external monitors, allowing for buttery-smooth imagery without tearing or stuttering. For those looking for maximum gaming immersion, dual Thunderbolt™ 3 ports, and display and HDMI 2.0 ports support up to three external monitors. Two speakers, a subwoofer, and TrueHarmony™ and Waves MAXXAudio® technology deliver incredible sound and hyper-realistic 3D audio using Waves Nx™. The Helios 500 stays cool with two of Predator Gaming’s proprietary AeroBlade™ 3D metal fans, and five heat pipes that distribute cool air to the machine’s key components while simultaneously releasing hot air. Fan speed can be controlled and customized through the PredatorSense app. The PredatorSense app can be used to control and monitor the notebook’s vitals from one central interface, including overclocking, lighting, hotkeys, temperature, and fan control. 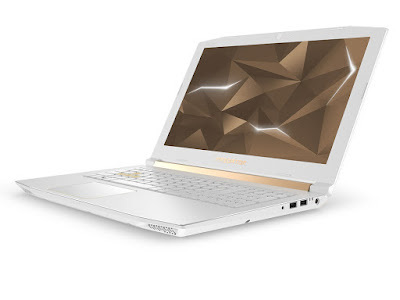 Predator Gaming’s budget-friendly Helios 300 gaming line sees the addition of a Special Edition model featuring an all-white aluminum chassis accented with gold trim, an unusually chic design for gaming notebooks. Exact specifications, prices and availability will vary by region. To learn more about availability, product specifications and price in specific markets, please contact your nearest Predator Gaming office.